eyes. I figured I’d give the show a try, not knowing if it would hold his attention. As it turned out, after the first episode he was hooked. 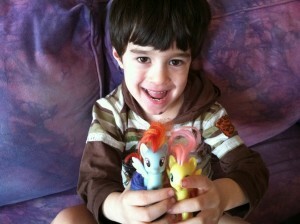 “Mommy, can I hold the ponies while I watch it?” He asked. “Sure.” I said with a shrug. “I want that one.” He said pointing to Rainbow Dash. He asked to watch episode after episode of My Little Pony all the while holding the tiny pony figurines in his lap. When I had Ari, I imagined we’d share similar hobbies. I taught him to play chess and twenty questions, but our mutual love for My Little Pony was a surprise. You see, when I was a child, I was obsessed with My Little Pony. I would become infuriated when my brother would steal my precious My Little Pony figures holding them just out of my reach. I remember one time my mom and I were in a toy store on the Upper East Side of Manhattan buying a birthday present for a friend of mine. I must have been six or seven years old. 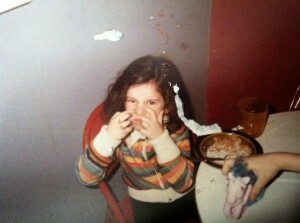 I begged my mom to get me another My Little Pony. I couldn’t understand why I wasn’t allowed to get just one more. I needed my fix. society’s stereotypes of what are “girl toys” and “boy toys.” My son certainly knocked those stereotypes out of the water. There you have it. He just likes them. 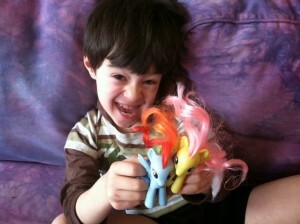 When I confessed to my friends that Ari was a My Little Pony enthusiast, I found out there was a name for him. Ari is a Brony. A Brony is defined as a male fan of the show My Little Pony. That’s just what he is, a boy who likes My Little Pony. I think it’s kind of great because it’s something to be proud of. Yo, what’s up? I’m a Brony, a boy who digs My Little Ponies. demographic of a female child. My point is, we can all love My Little Pony without labeling each other boys who like it and girls who like it. It’s a fun show.